For my card today I used the awesome pumpkins from the Bountiful Harvest stamp set from Verve stamps. I kept the card black, white and silver - except for the pumpkins - I tried to keep them more muted and on the grayscale. The sentiment was embossed with white detail powder and then I finished it with some bling here are there for stars in the sky: so much fun to create this! I think this pumpkin patch in gray scale is very interesting looking! Awesome card!! Love that little punch of orange in the center of that dark sky background. Fabulous inking on the night sky! Oh my word, Sankari! That spooky night sky is amazing. Such a fabulous card! Cute card! Love the way you die the nighttime sky! So clever! Lovely card , Dark something for tha occasion, like!!! You've created a beautiful pumpkin patch scene! So very pretty! 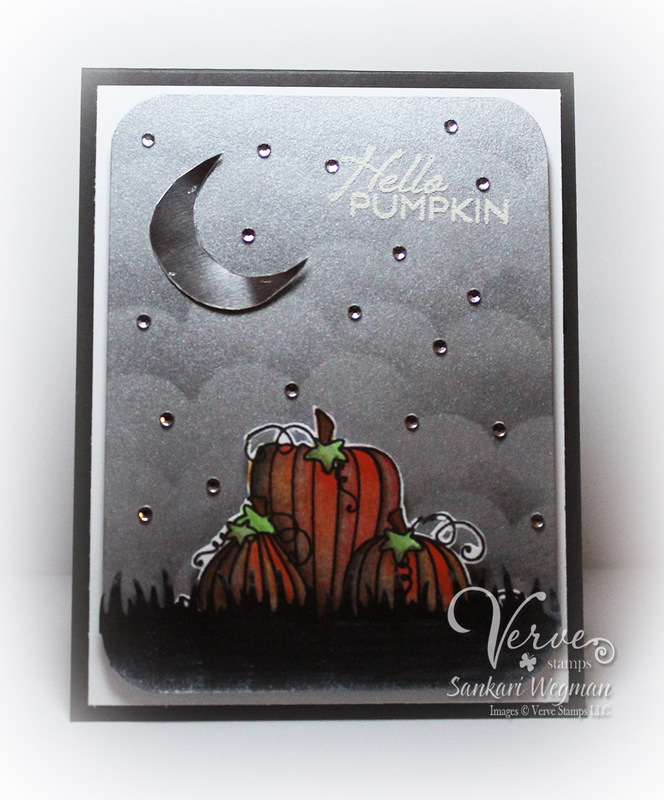 Beautiful card, love how you colored the pumpkins and your sky is great! What a great night sky - your card is awesome. Your bg sky is fabulous!! Great scene! Another really marvelous example of the non traditional use of coloring. Love, love, love it. Great sponging for the sky. Super cute! Love the glittery gray sky =! I love how the pumpkins pop and the gem detail in the background. You've created such a lovely scene. What a great background and I love all those glimmery rhinestones! Love the contrast! Great card. Neat idea to sponge the grey sky. Love your grey cloudy background and the great overall design. my goodness your card is stunning!!!! What a fun background! Love all the rhinestones, too. Oooh I like this, especially your moody pumpkins. Very atmospheric. Fabulous night sky with the shimmery moon. Love how you did the pumpkins, too. Everything is muted and pretty. Very Pretty. I love the background and the cut pumpkins is perfect. What a delightfully spooky card !!! So different for you, I wondered what I would find when I clicked on your name. The card is just wonderful. What a great spooky card! I love the spooky sky and the dark night pumpkins. It all works so well together! Love how you added the glam with the moon! Sankari, your card reminds me of the Great Pumpkin, Charley Brown. A movie I have loved since I was a little kid. You did a fabulous job of creating a night time pumpkin patch with the dark cloudy sky and glittery stars. Love it! Your card is fantastic. Thanks for sharing. Love that background. It's wonderful and spooky at the same time. Very spooky scene you created. Love the background you have created!! The moon is cute!! Love it! Awesome pumpkins and background! Love your awesome card! This is awesome! I LOVE that background paired with the pumpkins!!!! Gorgeous coloring of that pumpkin card! Love the sky effect too! Awesome card! you create amazing and stunning scene!!! Very dramatic looking card...love it.